Once a marriage breaks down, Anne is retained for the negotiation and preparation of a Separation Agreement. Anne usually obtains a divorce for you after the completion and signing of the Separation Agreement. Divorce usually is based on 1 year separate and apart. When a common law marriage breaks down, Anne is retained for the negotiation and preparation of a Separation Agreement. Anne is retained for the negotiation and preparation of a marriage contract for those getting married for the first time, and for second, third, or more! marriages. When parties wish to live common law without getting married, Anne is retained for the negotiation and preparation of Cohabitation Agreements. Anne helps her clients sort out to whom they wish to leave their assets and she ensures by her careful and thorough preparation that her clients’ wishes will be met. Anne also is retained by her clients to prepare Powers of Attorney for Financial and for Personal Care. When there is a conflict, e.g. by family members over the distribution of an estate, Anne is retained as the mediator to help resolve the issues. 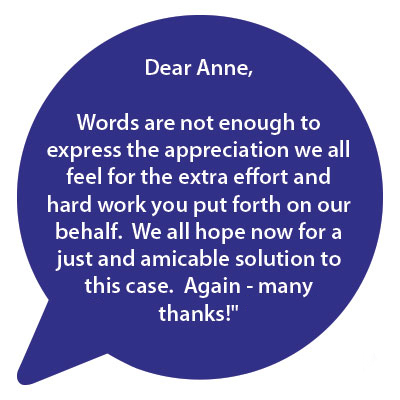 When a client cannot afford full legal representation but wishes help from Anne from time to time on different parts of their matter, depending on the case, Anne may assist the client in providing discrete services know as “unbundled legal services”.